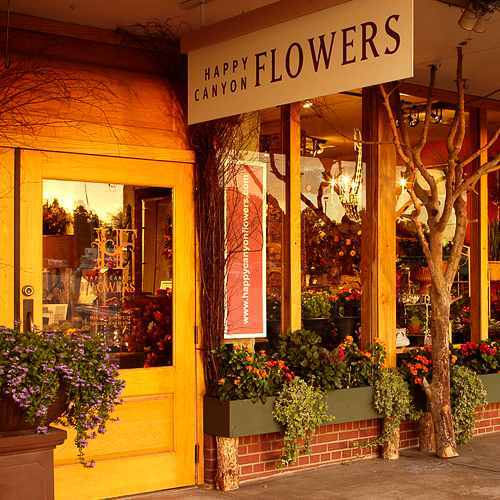 We at Happy Canyon Flowers attribute our success to our long-standing relationships. We're honored to be a part of our clients' most important moments: births, weddings, anniversaries, birthdays and holidays. Each day brings new visitors into our store and gives us opportunities to forge new long-lasting relationships. We also pride ourselves on our partnerships with local vendors and artisans. Whether visiting our plant and flower growers, or the artisans who furnish us with our unique home accessories and gifts, each share our standards of quality and desire for innovation. As for our staff, we're honored to have the talent and creativity our industry demands. From every walk of life and every background, each employee brings with them something unique and celebrated. Learn more about us on our Meet The Staff page. In a business that is built upon the beauty of flowers, Happy Canyon Flowers has cultivated relationships that last a lifetime. Always looking to the future, we honor our heritage by continuing to blend tradition with innovation. Our shop is open from 9:00 a.m. to 5:30 p.m MST., Monday through Friday, 9:00 a.m. to 5:00 p.m. MST, on Saturday. We are closed on Sunday. We are also closed on New Year's Day, Easter, Memorial Day, Independence Day, Labor Day, Thanksgiving Day, and Christmas Day. To celebrate the seasons we invite patrons and guests to join us for a number of annual and special events. Be sure to sign into our Guest Book and we will remind you of upcoming events. As we put the snow and cold days behind us, let's get together to celebrate our spectacular Colorado spring - see you March 08-09, 2019! As the weather turns crisp, enjoy the shift from summer into fall with our annual Harvest Days Open House - see you September 13-14, 2019! Discover the season where it begins. Delight all your senses with special gifts and holiday scents - see you November 01-02, 2019! Occasionally, substitutions may be necessary to create your bouquet due to the availability of certain flowers in various parts of the country. Care is taken to maintain the style, theme and color scheme of the arrangement, using flowers of equal value. Additionally, the substitution of certain keepsake items may be necessary due to increased demand, especially during major holidays. In single-flower arrangements, such as an all rose bouquet, we will make every attempt to match the flower type, but may substitute with another color. Delivery fees vary by zip code and range from $12 to $25. A local delivery fee will be added to each order, for each address. If you have any questions or need more information, please contact us at service@happycanyonflowers.com or 303-758-2511. We're always here to serve you and make your flower-sending experience a pleasure.